You’re going to read more about rums from the Monymusk distillery out of Jamaica in the next few years, I’m thinking, given how the island’s lesser-known products are emerging from the shadows; and distilleries other than Appleton are coming back into their own as distinct producers in their own right – Hampden, Longpond, Worthy Park, New Yarmouth, Clarendon/Monymusk are all ramping up and causing waves big time. But aside from the Royal Jamaican Gold I tried many years ago (and was, at the time, not entirely won over by) and the EKTE 12 YO from a few weeks back, plus a few indies’ work I have yet to write about, there still isn’t that much out there in general release… so it may be instructive to go back in history a while to the near-beginning of the rum renaissance in 2009, when Renegade Rum Company, one of the first of the modern independent bottlers not from Italy, issued 3960 bottles of this interesting 5 year old from Monymusk. Even in the Scottish company it kept (and many such outfits remained after Renegade folded), Renegade was not a normal UK indie. If one were to eliminate the dosing issue, they were actually more akin to Italy’s Rum Nation, because they married multiple barrels of a given distillate to provide several thousand bottles of a rum (not just a few hundred), and then finished them in various ex-wine barrels as part of their Additional Cask Evolution strategy. Alas, they seemed to have raced ahead of the market and consumer consciousness, because the rums sold well but not spectacularly, which is why I could still pick one up (albeit as a sample) so many years later. Moreover, as Mark Reynier remarked to me, finding the perfect set of aged casks which conformed to his personal standards was becoming more and more difficult, which was the main reason for eventually closing up the Renegade shop…to the detriment of all us rum chums. But I think he was on to something that was at the time unappreciated by all but the connoisseurs of the day, because while agricoles aged five years can be amazing, molasses based rums are not often hitting their stride until in their double digits – yet here, Renegade issued a five year old Jamaican pot still product that was a quietly superior rum which I honestly believe that were it made today, aficionados would be snapping up in no time flat and perhaps making Luca, Fabio, Tristan, Daniel and others cast some nervous glances over their shoulders. Anyway, let me walk you through the tasting and I’ll explain why the rum worked as well as it did. It nosed well from the get-go, that’s for sure, with Jamaican funk and esters coming off in all directions. It felt thicker and more dour than the golden hue might have suggested, initially smelling of rubber, nail polish, tomato-stuffed olives in brine and salty cashew nuts with a sort of creamy undertone; but this receded over time and it morphed into a much lighter, crisper series of smells – bananas going off, overripe oranges, cumin, raisins and some winey hints probably deriving from the finish. Tempranillo is a full bodied red wine from Spain, so the aromas coming off of that were no real surprise. What did surprise me was that when I tasted it, it did something of a 180 on me — it got somewhat clearer, lighter, sweeter, more floral, than the nose had suggested it would. Traces of Kahlúa and coconut liqueur initially, bread and salt butter, some oakiness and sharper citrus notes; this was tamed better with water and the fruits were coaxed out of hiding, adding a touch of anise to the proceedings. Pears, cashews, guavas, with the citrus component quite laid back and becoming almost unnoticeable, lending a nice, delicately sharp counterpoint to the muskier flavours the fleshier fruits laid down. It all led to a pleasant, tightly minimal and slightly unbalanced finish that was long for that strength, but gave generously (some might say heedlessly) of the few flavours that remained – cherries, pears, red guavas, a little more anise, and some salt. In a word? Yummy. It’s a tasty young rum of middling strength that hits all the high points and has the combination of complexity and assertiveness and good flavours well nailed down. It has elements that appeal to cask strength lovers without alienating the softer crowd, and the tempranillo finish adds an intriguing background wine and fruity note that moderates the Jamaican funk and dunder parts of the profile nicely. Though perhaps the weak point is the finish — which did not come up to the high water mark set by both nose and taste and was a shade incoherent — that’s no reason not to like the rum as it stands, to me. 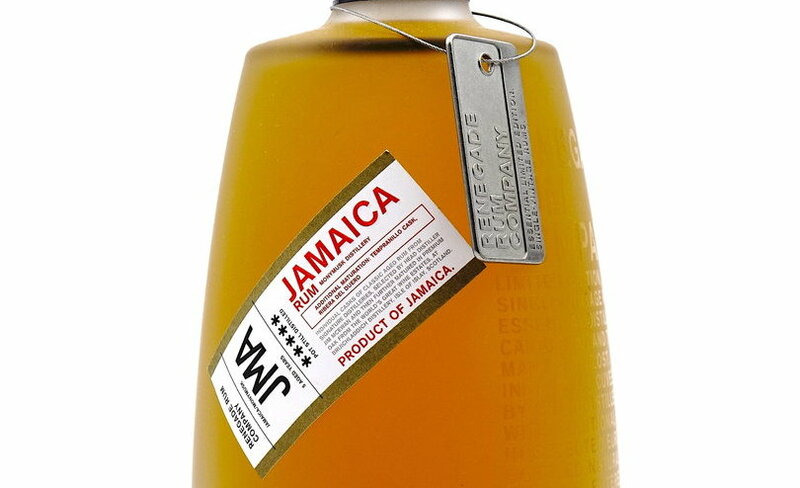 Anyway, in these days of the great movement towards exacting pure rums of distillery-specific,country-defining brands, it’s good to remember an unfinished experiment such as this Jamaican rum from Renegade, which pointed the way towards many of the developments we are living through now. That may be of no interest to you as a casual imbiber, of course, so let me close by saying that it’s a pretty damned good Jamaican rum on its own merits — which, if you were ever to see it gathering dust somewhere on a back shelf, you could do worse than to snap it and its brothers up immediately.